So I read East and West together so I feel like I’m still stuck in the world. Ha ha. I did really enjoy the stories and I loved the way they are written. Both books are fast paced and interesting, with something always happening. 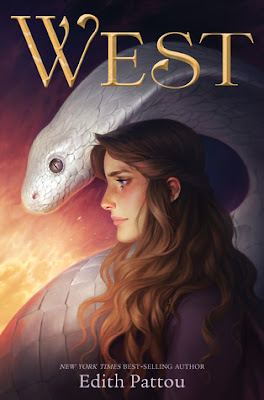 So when I started reading West, I didn’t read the description so I wasn’t even sure if it was going to be a continuation of Rose and Charles story or maybe Neddy would be more in the front row. As soon as I started to read about Charles getting on the ship, I thought, oh no Charles not again. Poor poor Charles. So in East I had loved the lure/superstitions about the birth direction and I wished Arne could make me my own Wind Rose. In West I really loved the Wind magic. I thought it was so creative the way that it is made a part of the story. It’s the kind of magic that seems natural and makes sense. I really enjoyed it being a part of the story. Just like East, the story is told in alternating perspectives and the way that Edith Pattou is able to keep the story moving by doing this is impressive. You are never confused and annoyed by the writing style, I think it really keeps the story going and makes it more interest. Plus Pattou’s writing just has that lyrical Fairy-Tale quality to it that makes you feel kind of dreamy while reading. I really liked the plot as well and the way there are different elements that you recognize from other stories. I love the characters! I had a fondness for the Fairy-tale Snow White and Rose Red when I was a kid. I’m not even sure why, to be honest. So I found myself instantly being drawn to the White Bear and Rose. Rose is just so fearless, clever and kind. She’s that person that you want to be friends with. Charles is just, oh poor Charles, he’s just a good guy so you find yourself rooting for him. I enjoyed Estelle but I wasn’t as connected to her as much as Neddy and Seb. Everyone in the story has their own special personality that makes you love them. If you like Fairy Tales this story is perfect for you. It’s not a retelling, it’s definitely it’s own thing but the way it’s written is just very magical. I had my eye on East for a very long time and I’m glad I finally read them. I read East when it came out, and have been waiting for this sequel. Thank you for writing this series.